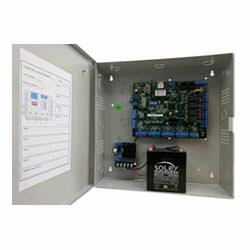 Our modular controller is the foundation of our access control system. It works with all Stor-Guard Keypads, Stor-Guard Bluetooth device and AccessPlus software. The controller communicates with both the keypads and the software. In the event that the controller loses communication with the software, it stores, and will use the stored info, until communication is reestablished. A customer will be granted access only if they are currently eligible. Our access control consists of three required components. These are software, controller, and keypad. Modular: Add as many controllers as required. Commercial Application: Up to 20,000 users and unlimited codes. Flexible: Connect to software using USB or with port-forwarding online.